MANILA, Philippines – The Metro Manila Film Festival (MMFF) 2018 organizers announced today, December 26, the results and list of top four (4) highest grossing films on opening day, Christmas Day. 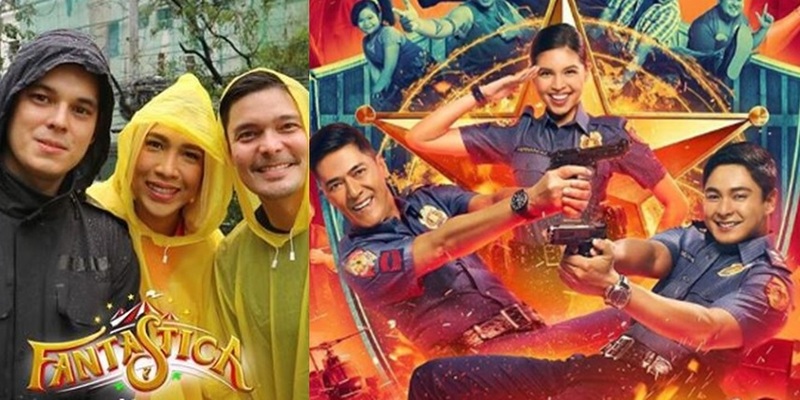 It's Fantastica vs Jack Em Popoy in MMFF 2018 box-office feud. A report by Aubrey Carampel on GMA-7's evening newscast '24 Oras' says: "Bukas naman [December 26] ay maglalabas ang festival organizers ng list of Top 4 movies or blockbuster films." MMFF 2018 Spokesperson Noel Ferrer in an interview today on DZIQ AM radio revealed that Vice Ganda, Dingdong Dantes and Richard Gutierrez's "Fantastica: The Princess, The Prince and The Perya" and Coco Martin, Vic Sotto and Maine Mendoza's “Jack Em Popoy: The Puliscredibles" topped the box office. MMFF 2018 Spokesperson Noel Ferrer reports that Fantastica and Jack Em Popoy are raking in box office. This was also validated with the interview of DZMM with Ferrer on Wednesday. "Ang sinabi sa akin, ganito na lang ang mangyayari kasi kawawa naman 'yung nagla-lag behind. I can safely say that we are really so happy and we are going to the target na P1 billion. Kaya lang, gusto sana natin equal distribution hanggang kaya ng lahat ng mga pelikula. Pero as expected, 'yung mga pelikula ni Vice Ganda at saka ni Coco Martin at Vic Sotto ang nangunguna sa takilya," Ferrer said. "The large part of the pie was really that of Vice Ganda and that of Coco Martin and Vic Sotto," Ferrer further explained and confirmed the order of the said movies according to box-office peformance. 'Aurora' ranked third. "'Yung pangatlo, medyo malayo, 'yung kay Anne Curtis," Ferrer added but did not disclose the earnings of each movies. NOTE 2: The producers, Executive Committe (ExeCom) and even the theater owners vowed according to rule NOT TO RELEASE the ranking, official earnings and box office gross to avoid the bandwagon effect. Other official entries to this year's MMFF, aiming to win hearts of viewers are: Jericho Rosales and Jessy Mendiola's "The Girl in the Orange Dress", Toni and Alex Gonzaga and Sam Milby's "Mary, Marry Me", Ricci Rivero and Jerome Ponce's "Otlum", Eddie Garcia and Tony Mabesa's "Rainbow’s Sunset" and Dennis Trillo, Kim Chiu and JC De Vera's "One Great Love." Ferrer also mentioned the possible changes in MMFF ranking after the awards night or the "Gabi ng Parangal" set at The Theatre at Solaire in Parañaque City on Thursday, December 27, 2018. Ferrer in separate interview said this year's festival aims to net ₱1 billion in revenues on its 44th year. The 2018 MMFF will run until January 7, 2019 in major cinemas nationwide.